On Thursday night I attended an event hosted by the Chicago Urban League, where the featured speaker was Bryan Stevenson, founder of the Equal Justice Initiative. Below is a Tweet posted from the event by MENTOR Illinois. I've heard Bryan speak via live presentations on the Internet in the past, but this was the first time I've seen him in the flesh. He talked of his own journey and use the term “proximity” to show how important it is to get close and personal to people living in poverty and stuck in racism and the American criminal justice system. 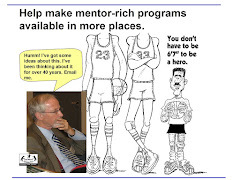 I also added links to my web library to the Equal Justice Initiative web site, and to the “Just Mercy” book that Bryan wrote. 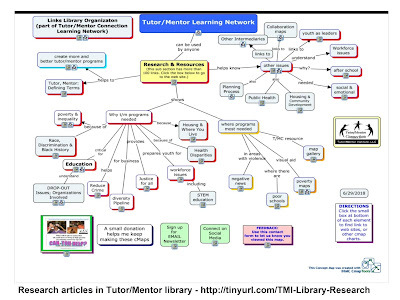 In doing so, I also updated the concept map that I use to point to different sections of my library. 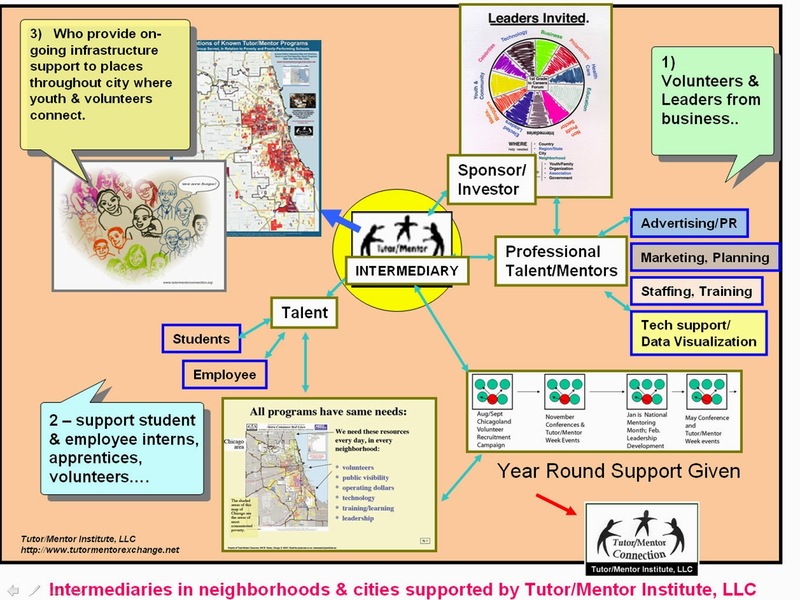 I have more than 2000 links in the main web library and more than 200 links in the section that points to Chicago youth serving organizations that include volunteer-based tutoring and/or mentoring in their strategies. I actually go through the library on an on-going basis so that at least once a year I open every link to remind myself of what information it is sharing and to make sure it still works. Often I post Tweets or messages in Facebook or LinkedIN to remind others of different links that I point to. 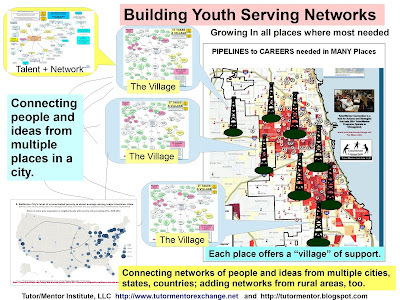 I've created dozens of visualizations since 1994 to try to communicate my role as an intermediary and to show roles others need to take to help youth in high poverty areas have the support systems they need to move more safely and successfully through school and into adult lives. The graphic at the left is one. You can find more in these articles or this page on Pinterest. 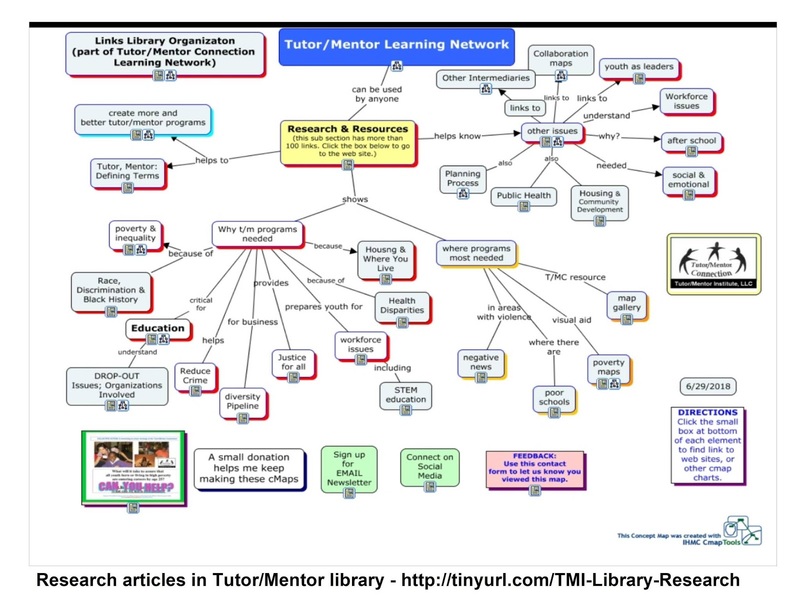 Or do a Google search for "tutor mentor intermediary" and then look at the images. However, my efforts alone are not enough. Others need to be digging into web libraries like mine, reading the articles, reflecting on what they say, then sharing them with others. 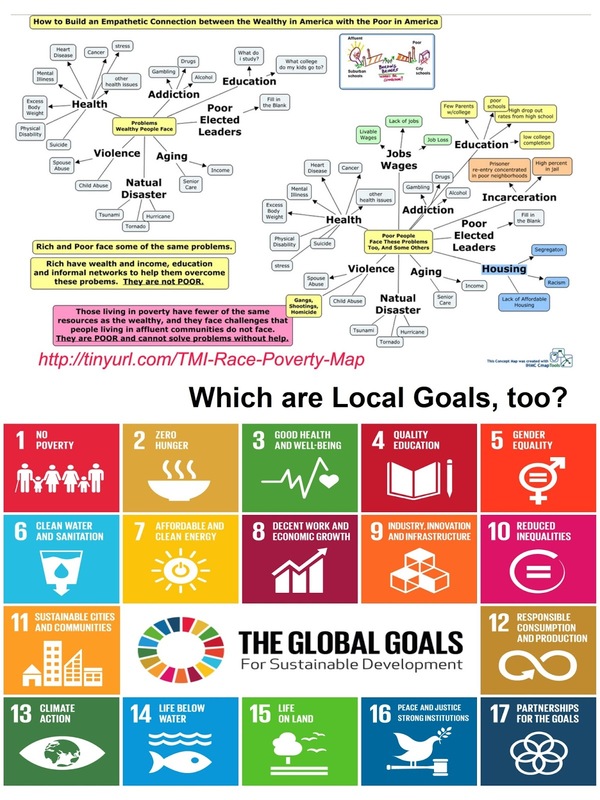 I've been pointing to the United Nations Global Goals Tweets and web site in articles like this for the past few months because of the way they itemize issues and try to draw attention to each of the 17 goals/issues they focus on. 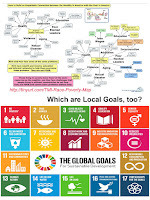 I included the SDG link in my library, plus many many more. Well Google has millions of dollars in investment and revenue to support what it does. I have my social security and that's all. Thus, for my library to have value others need to use it as I've suggested. Maybe a few will even become partners and investors to help me keep it updated, growing and available to Chicago and the world in coming years. Here's a page you can use to send your support. Stephenson ended his comments saying the size of your bank account, or how much you get paid is not what determines your impact on the world. It's what you do with your time. He could have been talking directly to me.